Nigel Poor, former Prison University Project instructor, visual artist, and co-producer and co-host of Ear Hustle, will join Earlonne Woods, former Prison University Project student and co-producer and co-host of Ear Hustle, for a talk at the Sydney Goldstein Theater in San Francisco on March 29, 2019. Ear Hustle is one example of the impact Prison University Project students are having on conversations around criminal justice and incarceration. “Ear Hustle presents stories of life inside prison, shared by those living it. The podcast is a partnership between ​Nigel Poor,​​ a Bay Area visual artist, and ​Earlonne Woods​​, formerly incarcerated at​ San Quentin State Prison​, and was co-founded with fellow inmate ​Antwan Williams. 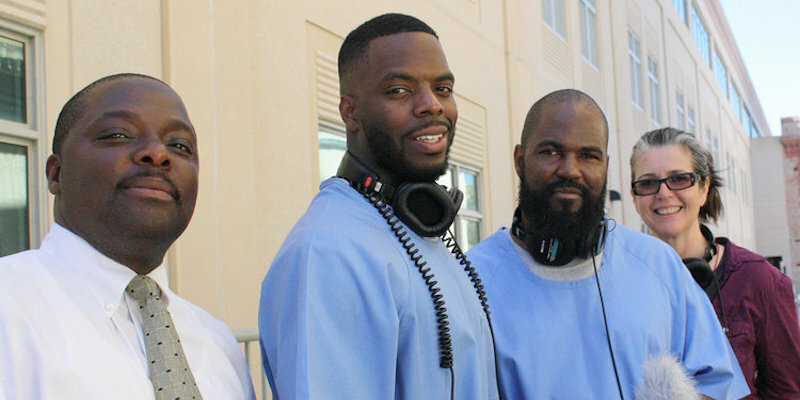 ​​The Ear Hustle team works in San Quentin’s media lab to produce stories that are sometimes difficult, often funny and always honest, offering a nuanced view of people living within the American prison system. In addition to co-producing and co-hosting Ear Hustle, Poor is also a visual artist whose work explores the various ways people make a mark and leave behind evidence of their existence. Her work can be found in various museum collections including the SFMOMA, the M.H. deYoung Museum and the Corcoran Gallery of Art, Washington, D.C. She is also a professor of photography at California State University, Sacramento. In November 2018, California Governor Jerry Brown commuted Woods’ sentence after 21 years of incarceration. Upon his release, Woods was hired by PRX as a full-time producer for Ear Hustle, and will continue to work with Poor, contributing stories about re-entry.